We are building a network of community partners and help to drive better awareness of existing organisations, who offer services to LGBT+ young people. If you would like to find out more, please fill in the form below. UK Youth is a leading national charity, committed to providing access to appropriate, high quality services in every community so that young people are empowered to build bright futures, regardless of their background or circumstances. Their network of 3,536 local youth organisations reach 1.5 million young people across the UK. Last year 94,913 young people took part in their life skills programmes, with 86% of these young people reporting at least one personal barrier (including living in an area of deprivation, being NEET, coming from a low income family). Of those young people, 64% reported an increase in their emotional and social capabilities such as - self-confidence, self-awareness, motivation, personal responsibility, receptiveness, and resilience and communication skills. Diversity Role Models actively seeks to embed inclusion and empathy in the next generation. Our vision is a world where everyone embraces diversity and can thrive. This will help create a world where future generations embrace, accept and support difference. ​Our mission is to create an education system in which every young person will know that they are valued and supported, whoever they are. We create safe spaces where young people can explore difference and consider their role in creating a world where we all feel accepted. Our student workshops feature positive LGBT+ or ally role models who speak openly about their lived experiences, building young people's empathy so they can understand the (often unintended) impact of their language and actions. In order to ensure sustained change we supplement this by training school governors, staff, parents and carers. Mermaids is a UK based charity that offers support to transgender and gender variant children and young people, their families and supporting professionals. Mermaids provide helpline and email support services, parents and teens online forums, training into schools, social services, and many other agencies supporting children, residential family weekends, local groups at eight locations nationwide, campaigning and advocacy, speaking at conferences and events nationwide, raising awareness by attending Pride and other LGBT events, advisory liaison service with EHRC, DofE, GEO and other agencies to help identify and combat poor practice. Mermaids is passionate about supporting children, young people, and their families to achieve a happier life in the face of great adversity. Pride in London is wholly run by a group of volunteers who are passionate about equality and diversity. We are a not-for-profit organisation, and any surplus funds we raise are used to support the LGBTQ community and improve the event. Together, we run the UK’s biggest, most diverse pride, and our job is to make sure we provide a platform for every part of London’s LGBT+ community to raise awareness of LGBT+ issues and campaign for the freedoms that will allow them to live their lives on a genuinely equal footing. Mosaic LGBT Youth Centre offers diverse range of services that support, educate and inspire young LGBT+ persons age thirteen to nineteen as well as those around them in London and surrounding counties. Do you need support to transform your school into an LGBT+ friendly place? 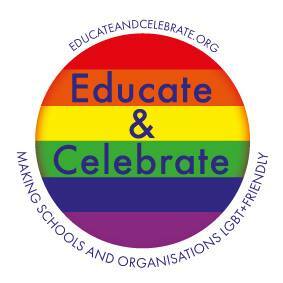 The charity Educate & Celebrate are an established team of experienced teachers who share their knowledge of making education at all phases LGBT+ inclusive. They have created over 200 Award schools and work with 100's of schools in the UK and beyond at nursery, primary, secondary and college phases in faith, special, single gender and mixed schools. Educate & Celebrate have also written a book ‘How to transform your school into an LGBT+ friendly place: A practical guide for nursery, primary and secondary teachers’written in partnership with Dr Anna Carlile, Senior Lecturer in Inclusive Education at Goldsmiths’ University of London Department of Educational Studies.